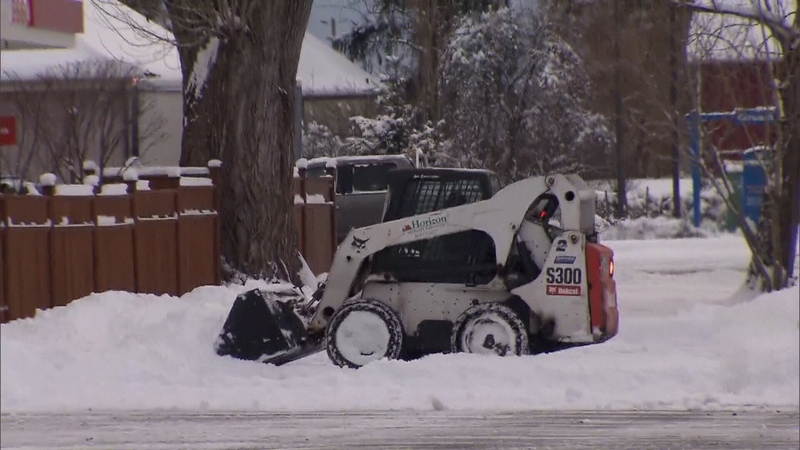 Another blast of winter weather hit B.C. 's South Coast Monday, just a day after snowfall triggered dozens of school closures across the region. Environment Canada issued fresh snowfall warnings for much of Metro Vancouver and the Fraser Valley, with some areas expected to see another 15-25 centimetres of snow by Tuesday morning. Snow started falling in downtown Vancouver at 4 p.m., slowly picking up in intensity. The only exceptions were Surrey, Langley, Richmond and Delta, which were only expected to see up to 15 cm. "A second low pressure centre in as many days will give more snow to the South Coast beginning this afternoon and continuing into Tuesday," the weather agency said in the alert. "This second disturbance will spread snow to virtually the entire South Coast with heaviest amounts falling tonight." The agency said the snow is forecasted to taper off during the day Tuesday. While the snow that hammered Metro Vancouver for hours Sunday let up in time for the Monday morning commute, it still left slippery conditions on many roads and made lane markings nearly invisible. Emergency crews were kept busy Sunday evening and overnight dealing with dozens of crashes and fender benders. By Monday morning, there were still many areas covered in compact snow, despite the efforts of city workers who were out in force throughout the night salting and plowing the streets. In Surrey, spinning tires were a common sight as commuters tried to reach their destinations. Pedestrians could also be seen trying to navigate the treacherous, snow-covered sidewalks. "I love snow, but not like this," one passerby told CTV News. Surrey tweeted it had “all resources out fighting the snow” and was prioritizing major routes. The city said 17 tandem and 18 one-tonne trucks have been working around the clock. Highway 1 near the Port Mann bridge was also a challenge. Around 5 a.m., many areas near the bridge were covered in compact snow, making lane markings very hard to see. While many people chose to take transit, there were issues on SkyTrain as well. 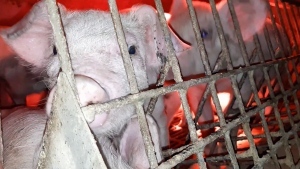 It took me about double the time," passenger Nives Chung told CTV. "My friend missed the last 10 SkyTrains, so I'm going to go home instead of going to work and probably work from home," said Brian Lai, another passenger. TransLink said snow and icy conditions meant many trains were being manually driven in certain areas. It warned passengers to expect delays. "It was a very unusual situation today," said spokesperson Chris Bryan. "In my time here I've never seen the Expo and Millennium line completely affected in that way… "
During Monday's afternoon rush hour, lines at Lougheed stretched outside the station. The situation was similar at New Westminster and Columbia station, with people squeezing onto packed trains. "I got to the SkyTrain station and I looked at the lineup or whatever and decided to just bus home instead," one commuter said. The heavy snowfall also led to several ferry cancellations Monday. According to the BC Ferries' website, the last round trips of the day for two vessels on the Tsawwassen-Swartz Bay route have been cancelled. The same goes for to the Tsawwassen-Duke Point route. Monday's snowstorm also caused dozens of delayed and cancelled flights. Several school districts, including Surrey Langley and Mission cancelled classes Monday. To receive weather warnings and alerts straight to your phone, download CTV Vancouver's free Weather Watch app. Check out the page for information, including how to download. 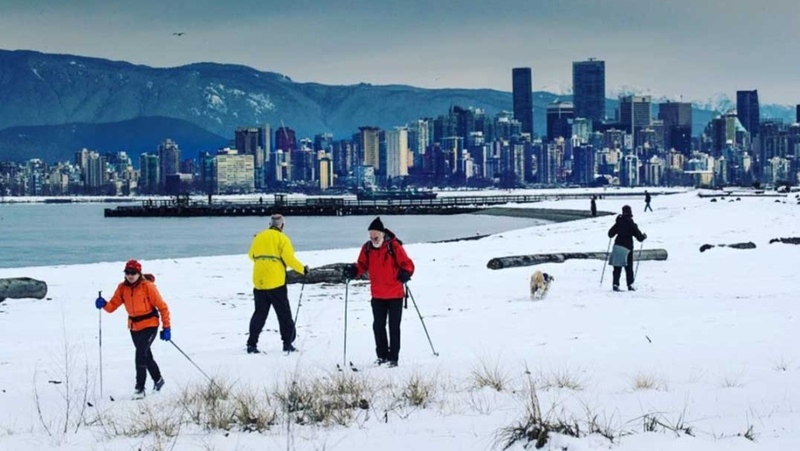 A photo by Instagram user @markaswan shows skiers at Spanish Banks. A snowplow is seen in Vancouver on Feb. 11, 2019. 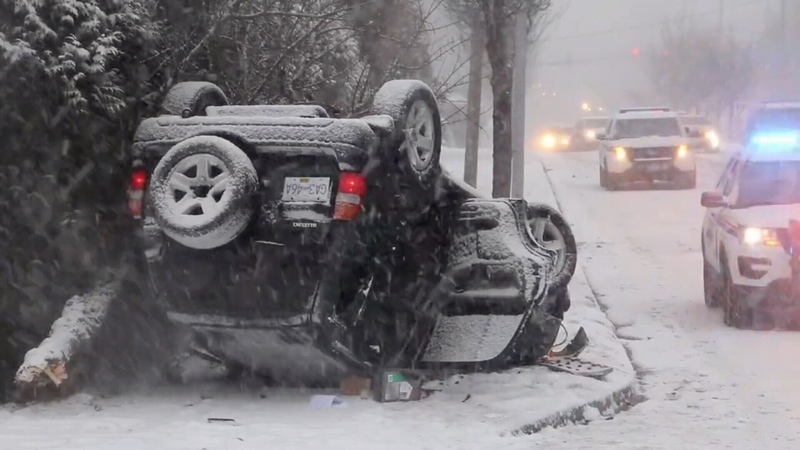 Crews responded to dozens of crashes and fender benders since the snow started falling on Sunday, Feb. 10, 2019.